excited to set foot on the New World! Our first stop was at the University of Wisconsin at Madison, where we were invited to an orientation program thrown by the organizers of the Khorana-Bose program. Here, I met with more Bose and Khorana scholars, some of them who had already started their internships and were sharing their experiences with us. We were given a tour of the Madison campus by former Khorana scholars, followed by an orientation session and a fun poster making session, where we had to team up with other scholars and design a logo for the Khorana-Bose program. Eric and Lexi, took us out on a trip to the Capitol Hill, after which we sampled Madison’s famous Fried Cheese! Bidding goodbye to the chilly weather and the warm welcome that we received in Madison, I flew to Boston to join my lab at Massachusetts Institute of Technology. I was working with Prof. James W. Swan of the department of chemical engineering, on predicting the behavior of field-responsive materials using computer simulations. 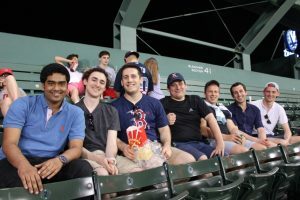 Boston can be a pretty expensive city to live in, but I was fortunate to find accommodation at an Independent Living Group run by MIT undergrads, called the MIT Student House, which gifted me with the opportunity to get to know and hang out with some undergraduate students from MIT. I have read about things like culture shock, how difficult it may be for somebody stepping out from their native culture and adapting to a different culture, but the company of my fellow house-mates coming from all parts of the world, never made me feel that I was away from home! 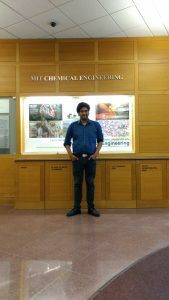 Although the work load at MIT can get pretty intense at times, there are ample opportunities for one to indulge in fun activities and sneak out some time for weekend getaways. I did kayaking on the Charles River, and even played soccer in the MIT intramural championships! I also went on short trips during the weekends to Rockport Beach, Cape Cod, went hiking on the Blue Hills, which were refreshing breaks from the bustle of the city. the disappointment of the crowd including ourselves, the Red Sox lost to the Tigers! Working at one of the best universities in the world introduced me how to handle stressful situations in research. No matter how good you are, you will make mistakes, and a successful researcher is one who learns from their mistakes. 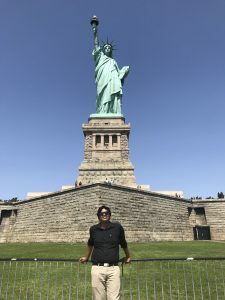 It has been a month since my internship got over, and as I type this blog, I am transported to some of the memories I made. I am thankful that I got to participate in the program and I look forward to go back to the United States again in the future!